A flat-screen TV rolled out Wednesday by LG looked barely thicker than a piece of posterboard. Las Vegas, Nevada (CNN) -- Think your TV is pretty slim? After seeing LG's new television, you may want to put that flat-screen of yours on a diet. 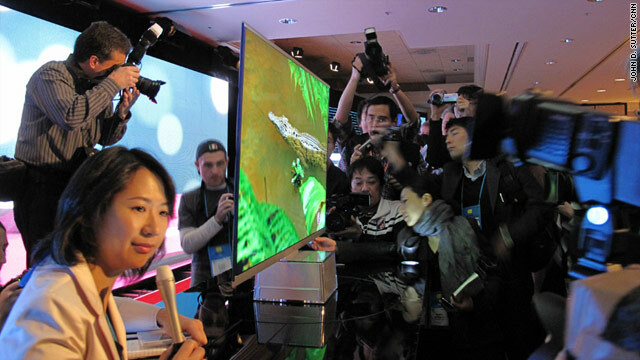 The South Korean electronics manufacturer unveiled a television Wednesday that is less than 7 millimeters thick. The product, which is so new it doesn't have a name, was brought on stage briefly during an LG press event at the Consumer Electronics Show in Las Vegas, Nevada. It looked to be not much thicker than a piece of posterboard. A spokeswoman said the TV should be available late this year. Previously, LG's thinnest TV was 23.3 millimeters thick, or about three times as wide as the new hyper-slim television, said Woo Paik, LG's chief technology officer. "This is a brand new product, and it's very exciting," Woo said at the event. Few details on the super-skinny TV were immediately available. LG announced a number of new television products in its Infinia line, and representatives said most of the company's TVs this year will be connected to the Internet and to other home devices, a trend the industry calls "connected TV." The company emphasized the diversity of its product lines -- from smartphones with projectors to energy-efficient washing machines -- and said 3-D television will soon be available from LG.